A Medieval lead alloy token, dating AD1425-1490. Mitchiner and Skinner (1984, p.95, no 44). 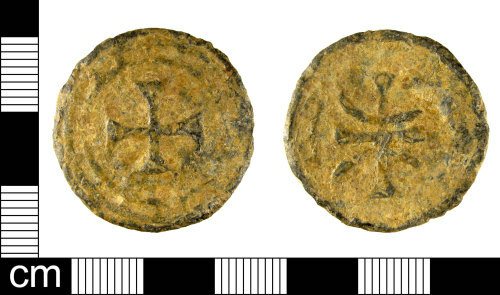 Cross and pellets on one side, merchants mark on the other. Dimensions: diameter: 27.89 mm; thickness: 2.76 mm; weight: 11.64g.